Semtech Corporation (Nasdaq: SMTC), a leading supplier of analog and mixed-signal semiconductors, today announced that its Wireless Charging Evaluation platforms are now available directly through online distributors Digi-Key and Mouser Electronics. The Transmitter and Receiver platforms are available in a variety of power configurations and provide the tools design engineers need to quickly prototype and demonstrate their wireless charging applications. The platforms offer users a complete kit that includes a PC board with a controller, other components such as FET Driver, buck regulator, and rectifier (depending on the kit), and firmware that is easily upgradeable by the user. 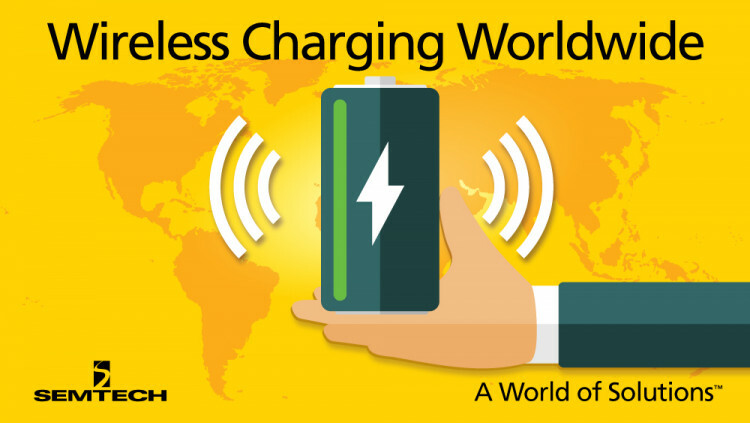 The kits make it easy for engineers to develop and test wireless charging applications for low powered mobile and wearable devices, medium-powered electronics equipment such as laptops, monitors and car charging systems, and high powered devices such as power tools. The kits can also be used to develop and test wireless charging infrastructure applications such as furniture and countertop embedded wireless charging, which is becoming widespread in the hospitality industry and in places such as coffee shops, restaurants, hotels, office buildings and airports. “We’ve seen a big spike in demand for our industry leading, multi-mode and flexible wireless charging solutions from our customers. The demand has been across a wide spectrum of applications in the wearables, portable consumer electronics, infrastructure and hospitality markets. Making our “plug ‘n play” evaluation kits affordable and easily accessible to customers will help allow them to accelerate their products to market,” said Ruwanga Dassanayake, Product Line Manager for Wireless Charging for Semtech’s Power and High Reliability Product Group. For more information on Semtech Wireless Charging Evaluation Kits, visit: www.semtech.com/power-management/wireless-charging-ics/evaluation-kits. Flexibility: Multi-mode wireless charging kits support all major wireless charging standards (both transmitter and receiver), work in multiple configurations and form factors, and can quickly be adapted to support evolving wireless charging standards. Scalable Power: Supports a wide range of power solutions ranging from 100mW low power to faster charging 15W medium power solutions and beyond. All statements contained herein that are not statements of historical fact, including statements that use the words “allow,” “offer,” “will” or “supports” or other similar words or expressions, that describe Semtech Corporation’s or its management’s future plans, objectives or goals are “forward-looking statements” and are made pursuant to the Safe-Harbor provisions of the Private Securities Litigation Reform Act of 1995, as amended. Such forward-looking statements involve known and unknown risks, uncertainties and other factors that could cause the actual results of Semtech Corporation to be materially different from the historical results and/or from any future results or outcomes expressed or implied by such forward-looking statements. Such factors are further addressed in Semtech Corporation’s annual and quarterly reports, and in other documents or reports, filed with the Securities and Exchange Commission (www.sec.gov) including, without limitation, information under the captions “Management's Discussion and Analysis of Financial Condition and Results of Operations” and “Risk Factors”. Semtech Corporation assumes no obligation to update any forward-looking statements in order to reflect events or circumstances that may arise after the date of this release, except as required by law.